I am ready for Summer even though we are still in our Spring Season. 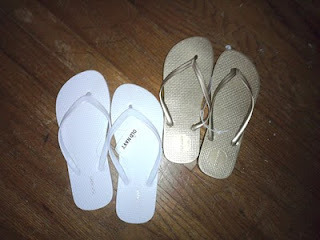 Since Old Navy had the Spring Sales and this 2 flip flops were only $5.00. I definitely took the advantage. It's a gold and white color and I love it because I can match them with the shorts, pedals or pants I will be wearing. It is not bad though, I love the color and the softness of this flip flops.